I've been planning a trip to the Caribbean recently, and since I personally haven't spent much time there, it has meant diving into the resources available to me as a travel agent and making myself an expert on the topic! Which just so happens to be one of my absolute favorite parts of this job. Anyway, I thought I'd share some of the insights I've gained through my research, and I'd love to know ... if you are an all-inclusive buff, does my research hold true? Here's what I discovered during my research and by learning from the agents who have "been there, done that." Aruba is amazing, but you're doing yourself a disservice if you choose an all-inclusive resort on the island. It's considered a true foodie destination with amazing restaurants around every corner, and once you get there, trust me, you'll want to venture off the property to explore some of your delicious options. In fact, to help encourage tourists to patronize the local restaurants while still helping them plan for costs, Aruba offers what is called a Dine Around card. Visitors can choose from packages of lunches and/or dinners that are good at 30 different restaurants around the island. So they get the flexibility to eat where and when they want while still being able to budget for those costs up-front. Not every island or destination has a plethora of all-inclusive options. Before I started my research, I thought all-inclusive resorts were a dime-a-dozen, but that's just not true for every destination. And if you have additional requirements (adults-only, casino, etc.) you may end up with no good options in certain destinations. Visiting an all-inclusive in the spring doesn't necessarily mean you'll be overrun with spring breakers. 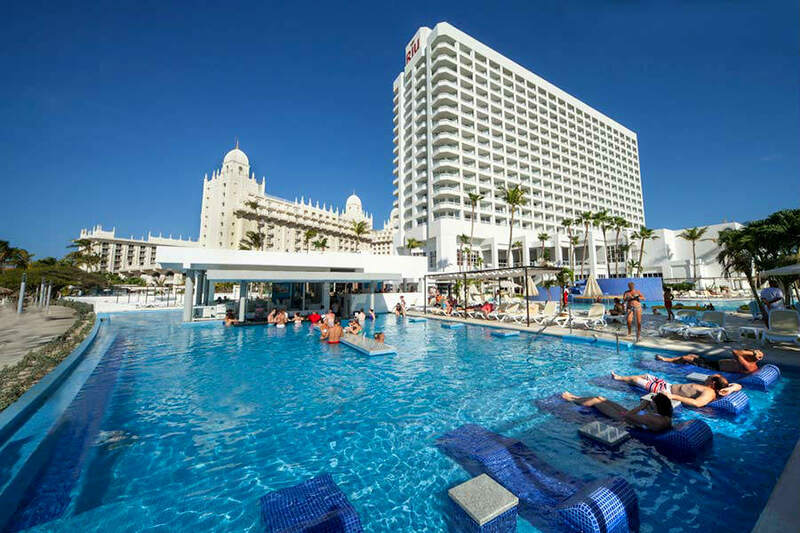 In fact, most resorts have stricter age requirements during the prime spring break months, and some even have policies expressly prohibiting spring break groups. Each resort has its own policies and personality, so that's another great reason to work with a travel agent who can help find the right resort for you. Beaches vary widely. You may assume that if you're headed to a beach resort in a tropical location, the beach will be amazing no matter what. That is just not the case. Some beaches are public, some are private, some have calm waves and are great for swimming, while others have rougher waters better suited to surfing or watersports. Sometimes, the sand is amazing and pristine powdery white and other times, it's covered in seaweed. The beaches can also change due to erosion or sand movement caused by tropical storms and hurricanes. So be sure to let your travel agent know exactly what you want out of your beach experience, and they can match you to the right resort for you. All-inclusive resorts include your food and drinks, but they are not all created equal in this regard. In addition to the items mentioned above, you're going to have different numbers and types of food and drink options depending on your resort. Does the resort have one main restaurant and guests must make reservations at the others? Do guests have privileges at other neighboring resorts, thus expanding your culinary options? Is there poolside/beachside drink service, and for how long? What about room service? If these things are important to you, make sure you convey that to your travel agent so they can narrow down your options and ensure you aren't disappointed. These are just a few of the insider tips and suggestions that I have learned as I have researched all-inclusive vacations. Do you have your own nugget of advice? Your own favorite resort in the Caribbean? I'd love to hear about it! And, of course, if you'd like to benefit from all of my knowledge (at no cost to you), just shoot me an email and I'll get started helping you plan the trip of your dreams!